Roast at 325 degrees for 2 hrs. (1.) Rub meat with salt, pepper, and ginger. (2.) Place pork on a rack in a roasting pan. Insert meat thermometer into the loin not in the fat. Pour 1 1/3 cups of water into orasting pan. (3.) Roast in slow oven (325) for 1 hour. worchestershire sauce in small bowl; blend well. Remove and reserve 2/3 cup for sauce. registers 170 degrees or about 1 hour longer. Remove roast from oven to heated platter. 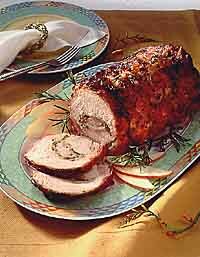 Slice loin; serve with orange sauce.